TREND - Americans getting together to bang the drum communally. African jazz musicians, lately seized on by spiritual seekers. not a bad way to access your inner beast. Yoga is fine, but if you want spiritual uplift with a little more noise, try beating on some bongos. 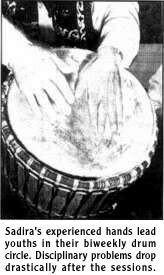 African and Asian cultures have been practicing community percussion for thousands of years. 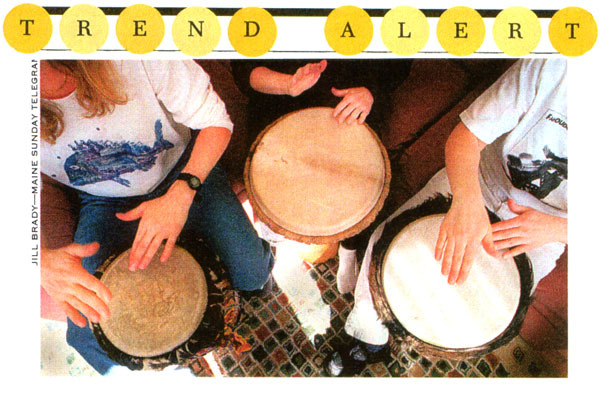 Now Americans are fast joining "drum circles," informally or through organized centers, to reduce stress, connect with others, or just jam. A recent study in the journal Alternative Therapies even found an increase in disease-fighting cells among participants in drum circles. Rhythm circles have been especially popular with women, who say the once male-dominated musical form offers a powerful means of expression. But the groups, which have doubled in the past five years, are also attracting executives, health professionals, and schoolchildren. The most popular drums are the Afro-Cuban conga and the West African djembe - a loud, responsive instrument with the brightest high tones and deepest, most sensual lows. 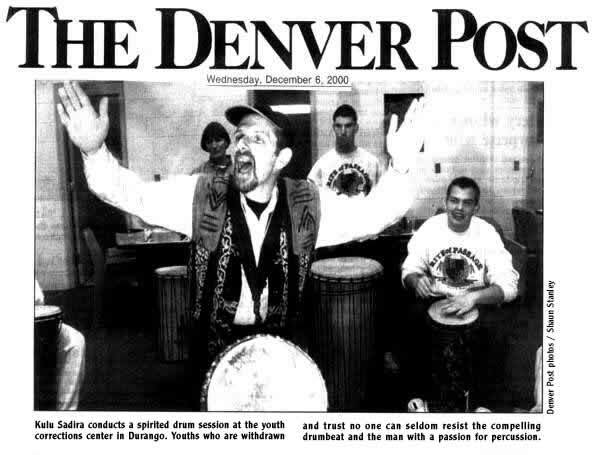 "Drumming is primal," says Kulu Sadira, who conducts circles for at-risk youth and corporate honchos out of his World Beat Circle in Durango, Colorado. "It brings people together in a trusting way they often have never known before." DURANGO -- There was a rumble Tuesday at the youth corrections center. At least it started as a low rumble before building into an acoustic siege. Fourteen adolescents, who one way or another have gotten themselves crossways with society, pounded away on West African djembe drums. They beat and they shook everything from seedpods to tambourines with musician Kulu Sadira. Sadira led them through their primal rhythms, stirring combinations of discipline and wild abandon quite capable of seizing control of the nervous and circulatory systems of anyone close. The sound was impressive, but the cooperative release of fierce emotion is the point, Sadira says. "This is one of the highlights of my drumming, being here with you," Sadira told the teens when they first filled into a room of cinder-block walls and sat in a ring of teal green plastic chairs before tall, gracefully curved drums. Sadira started them out playing a heartbeat on the drums. Most of the teens seemed a little shy, a little uptight for the first five minutes, but wide grins were everywhere 10 minutes into the session. Coaxed by Sadira, the teens cried out and sang out. After 40 minutes or so, several were on their feet, dancing, although Sadira calls it "movement" lest he intimidate someone with the other word for it. Logs at the center that track disciplinary measures, such as puch-ups, for misconduct are "empty for hours" after the biweekly drum circles, teacher and avid drummer Robert Aspen says. It's just harder to fight with someone after you've made good music with him or her, Sadira says. "It's a ritualized way to blow off steam. The scrawniniest kid can make as big a noise as anyone and feel powerful in his space." Young offenders who trust no one and who try to stay withdrawn can seldom resist the compelling drumbeat and the man with a passion for percussion, says Scott Shick, director or the Robert E. DeNier Youth Services Center. "You have to use twice as much energy to resist it than to let go," Sadira says. "It's so basic, it's not something we have to learn. It's something we have to let go." 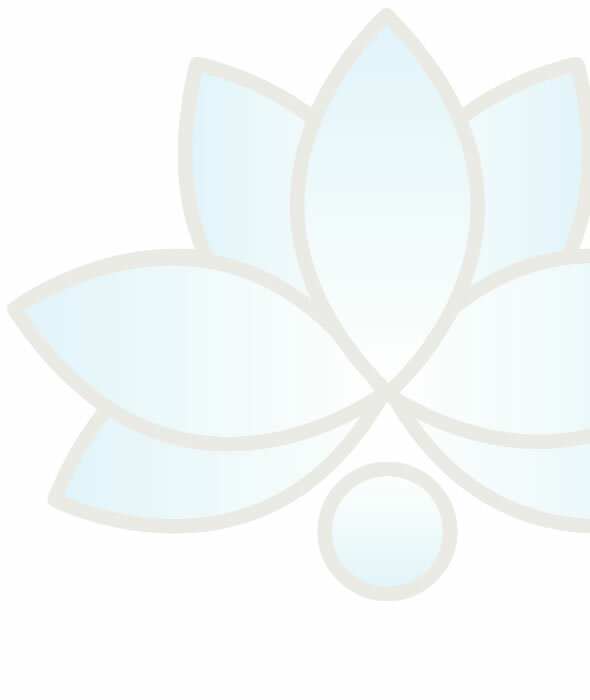 Outside the center, Sadira works with everybody from corporate executives to Alzheimer's patients, who, he says, often exibit remarkable lucidity after a neuron-rearanging drumming session. He designs drum programs for "conflict resolution, team building, stress management and inspiration and transformation." Shick says the drum circle is therapeutic in the best possible way -- that is, without the boys and girls here thinking of it as therapy. It just seems like a crashing good time. And the youths are hungry for ritual, tradition and symbolism, all part of a drumming sircle Shick says. Shick works for Rite of Passage, an academic, vocational and atheltic program for troubled teens that has run the state's 28-bed facility in Durango since it opened in January. He says that he is always looking for alternative approaches to helping young people succeed individually and with their peers. "Drumming really breaks the ice, loosens them up," Shick says. "It helps them be themselves." This is no small think, he says, because many here are very distrustful. of people who say they want to help them. Sadira, a percussionist since he was 15 years old, traveled as a band musician for many years with B.B. King, Etta James, Kenny Loggins, Glen Frey and Jimmy Buffet before wearying of life on the road. "I wanted to do something more wholesome and make a differnt kind of contribution," Sadira says. In 1991, he founded Tribal Rhythm Quest, a drum and dance troupe. He's lived in Durango since 1995 and owns Kulu Music and Emporium. With his drumming circles, he says, he really does have his finger on the pulse of the community.